Yet again, intense, destructive fires are all around California. I found a protection spell to protect those “kings” and “queens” who are fighting these fires; and to protect those whose homes and animals are at risk. Let us send safety and healing to those whose homes and animals have perished in the flames. 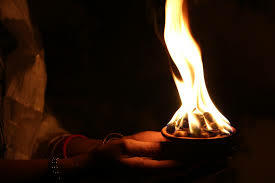 “Lighting the Flame” was a daily ritual in the ancient temples. At daybreak the priests would light the sacred fire just before the sun – Ra – rose in the east. The sacred flame of Ra is warm and life-giving. Fire has been a “savior” to human-kind, providing warmth and light, protecting us from the dark and cold. Come towards the King, Nb-twy (Lord of the Two Lands) . . .
And every evil of this year . . .
And every arrow of this year.